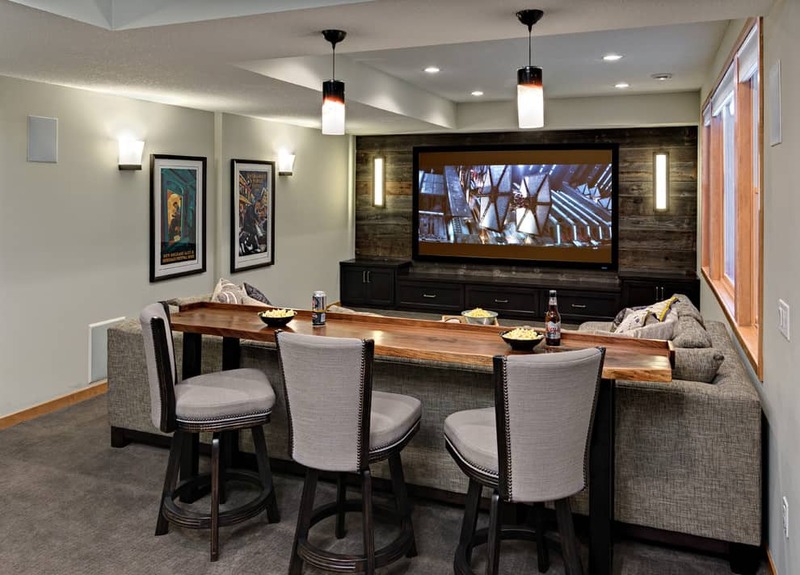 In redesigning your basement, you probably have seen a lot of inspiring designs that features spacious and well-lit rooms. This might not be your case. 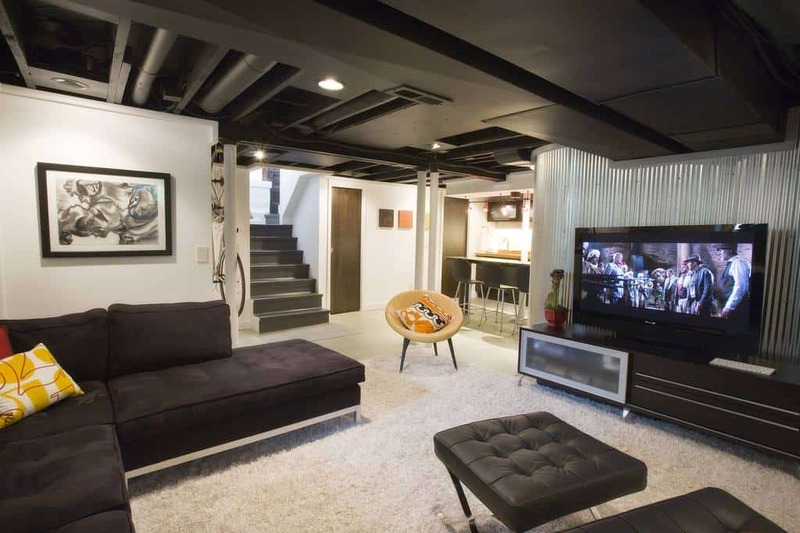 In a basement with limited space, you might want to consider using a dark -or mostly black- color scheme. 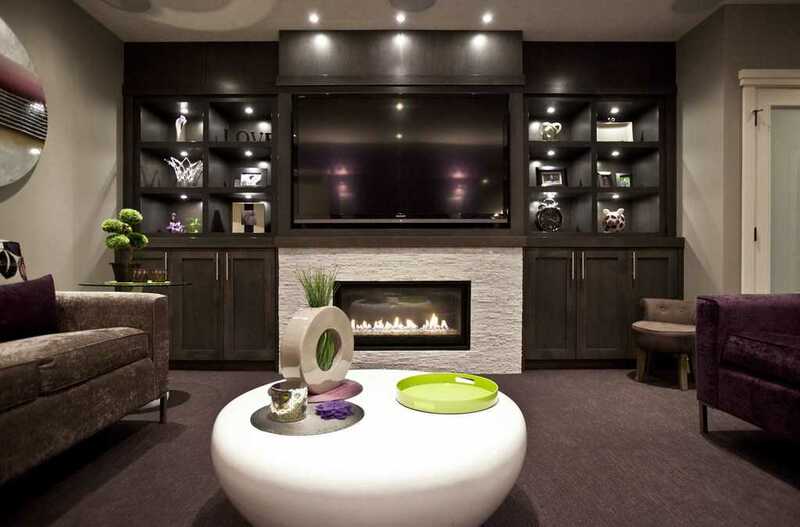 To make small basements look and feel spacious, the use of black on your wall or open ceiling can create an illusion of space in an otherwise cramped room. This is especially true in basements with low ceiling heights. Not only it helps tricks the mind, black is also effortlessly chic. 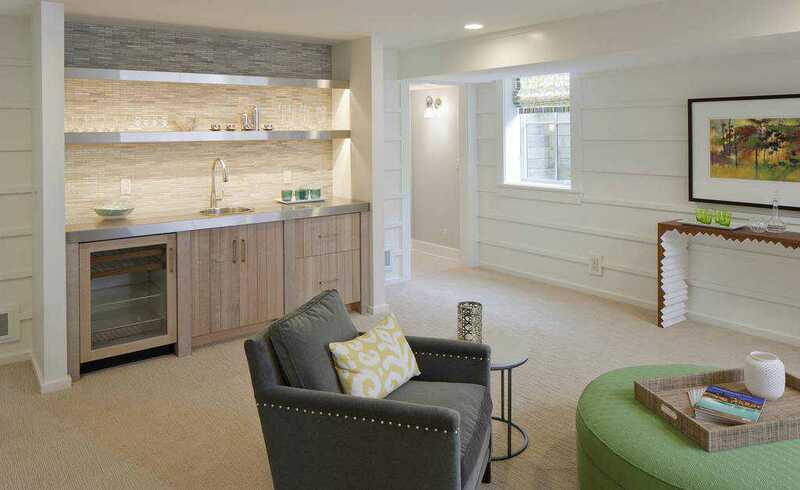 Selecting the materials and finishes also plays a major factor in a basement makeover. 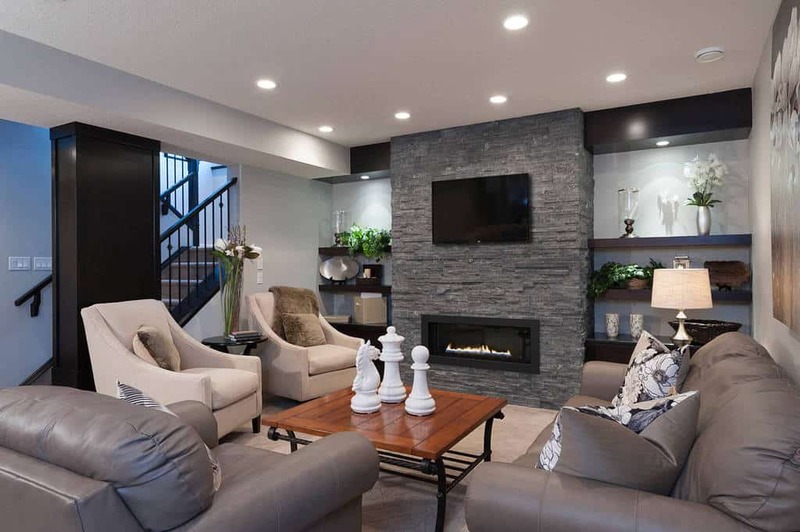 Using different materials on your walls and ceiling that are soft to touch like a fabric covered wall makes an interesting contrast to the other hard surfaces like stone or cement. Same thing goes with matte and glossy finishes such as tiles and wood. The smart and creative use of these materials and finishes will result in a visual and tactile experience which offers an unexpected surprise and also pleases the senses. 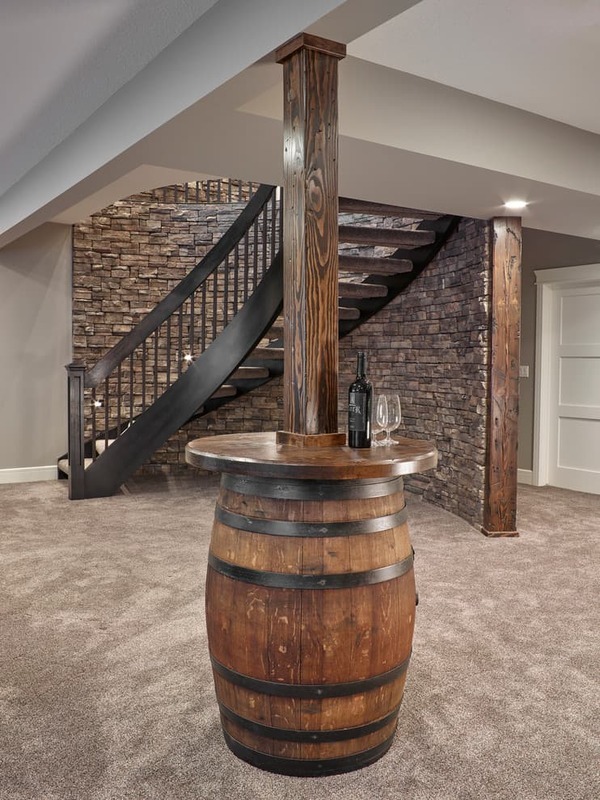 So get ready and take a look these perfectly captivating basement design ideas that some will show you what black paint and different finishes can offer to your basement. A dramatic seating area in dark monochromatic color scheme is accentuated by a round white coffee table that matches the facade of the fireplace. Photo by Richard Manion Architecture Inc.
A cozy entertainment area with an off-white wall finish and cathedral ceiling create an illusion of a spacious domicile. Blue and green color scheme brightens up an all-white interior. The sliding door hides the sleeping area for privacy. The all-black bar area lends its color to the grey sofa and coffee table to create a harmonious chic vibe all throughout the interior of this flat. 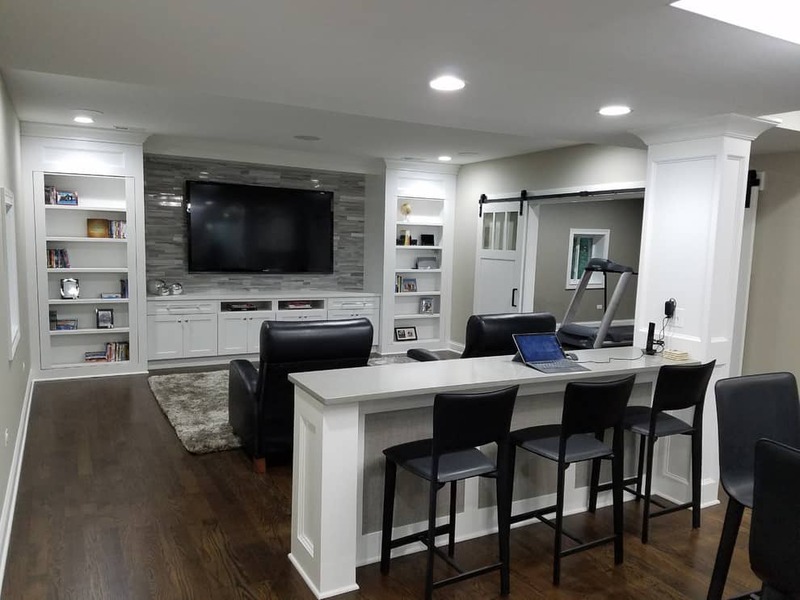 Photo by Hinsbrook Construction, Inc. 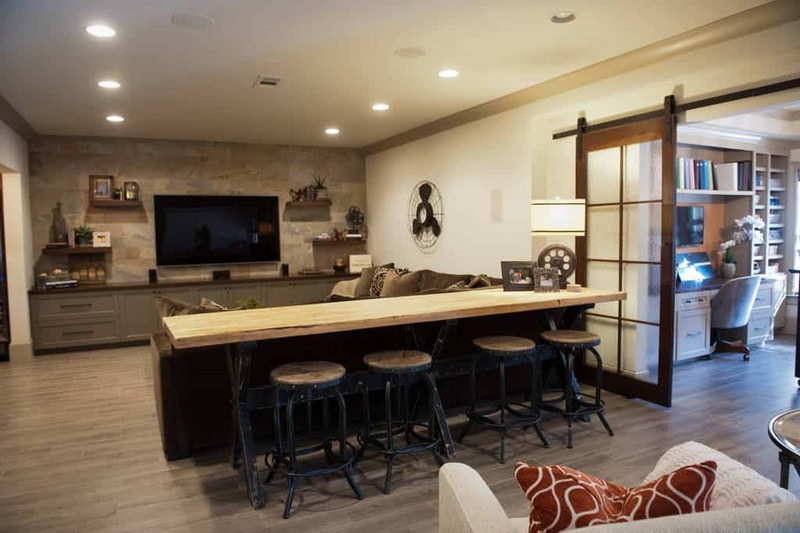 The black and white color scheme of the seating and bar area creates an interplay of colors with the hardwood flooring. 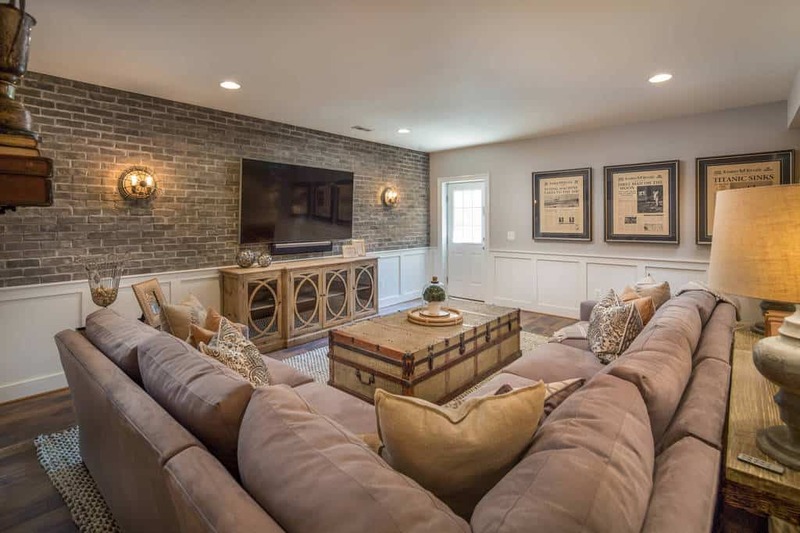 The TV hanging on the wall is accentuated by glossy grey brick tile. This pad is filled with contemporary furniture pieces and highlighted by the chocolate stained wood wall. The artwork gallery energizes the room through an unexpected addition of color. 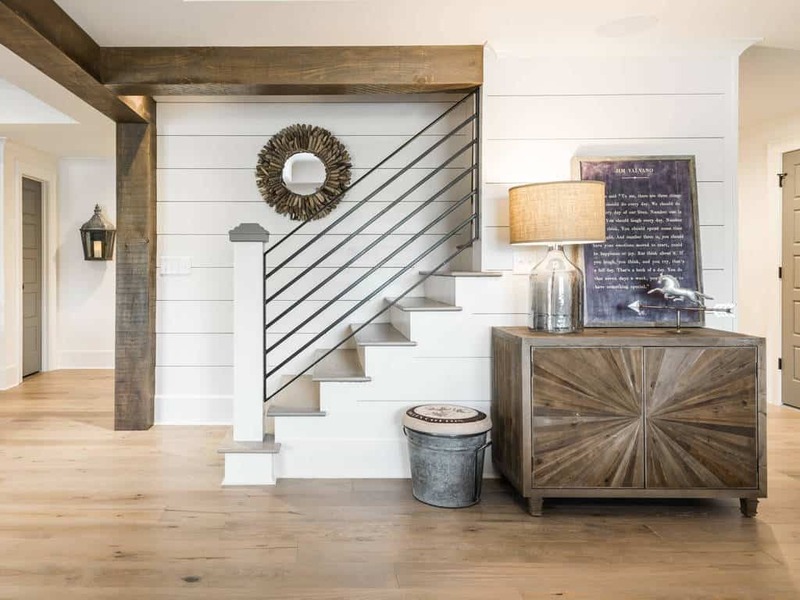 A staircase of this household features a minimalist handrail while different wood finishes grace the sideboard, trusses, and hardwood flooring which created a warm ambiance. 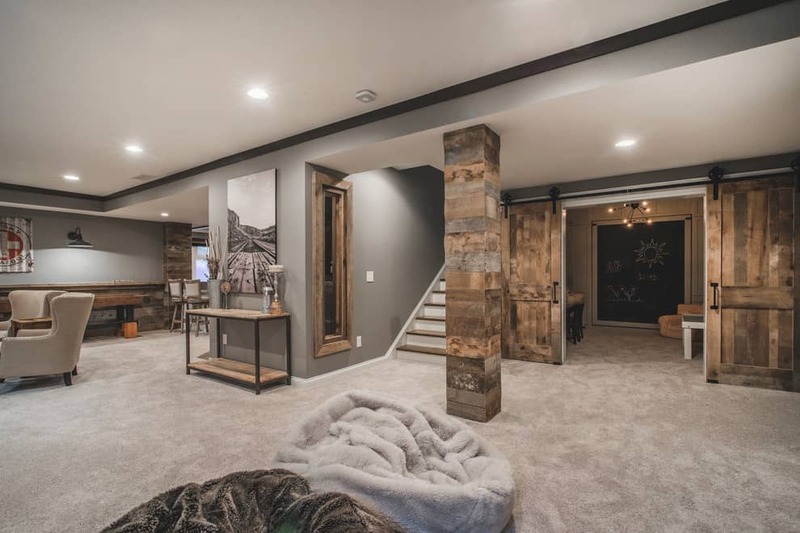 A secret door cleverly hides through a collection of wood that forge a rustic yet cozy ambiance with the rest of the interior. 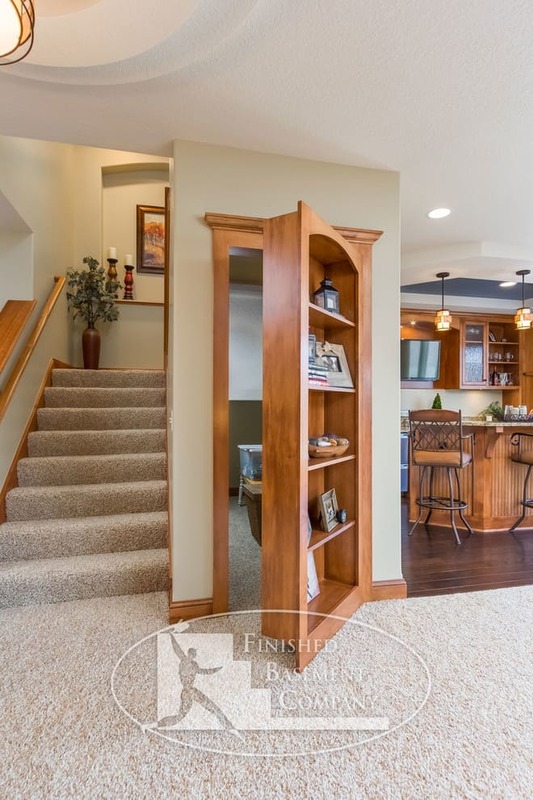 Different colors and textures that appear in the carpet flooring, sheet metal covered wall, and ceiling creates a welcoming appeal for this lovely abode. Grey carpet flooring complements the plain white wall and wooden table top behind the grey sofa. 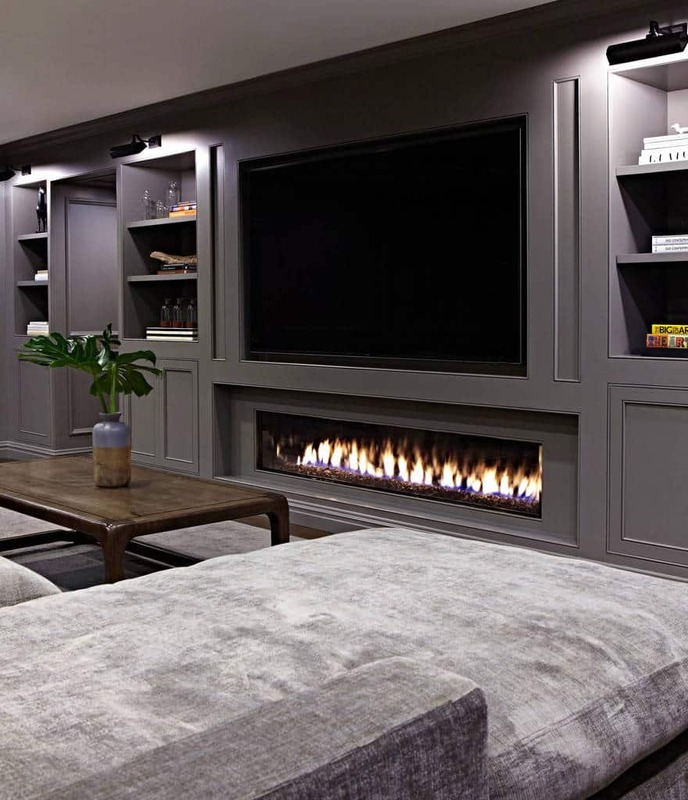 A protruding fireplace holds the TV of an exciting interior. The glossy finish of the coffee table brings the attention to itself surrounded by the leather sofa and cream armchairs on this habitat. 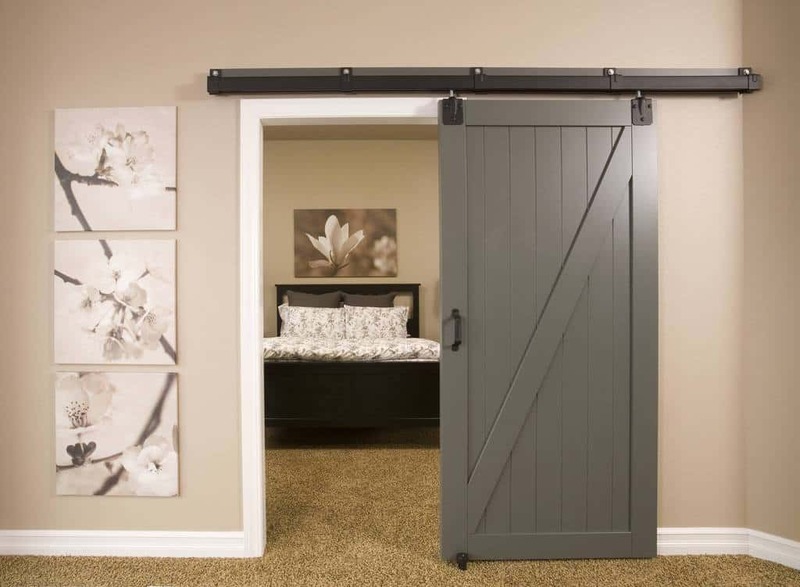 Grey colored sliding door offers a peek of the bedroom on the other side of the room. Cherry blossom paintings reinforce the feminine vibe of this pied-à-terre. 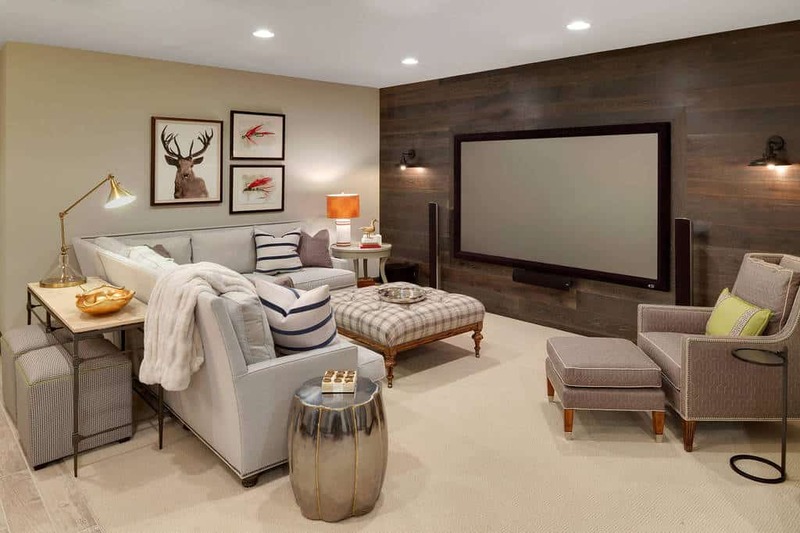 A monochromatic neutral palette works flawlessly in this game room interior. 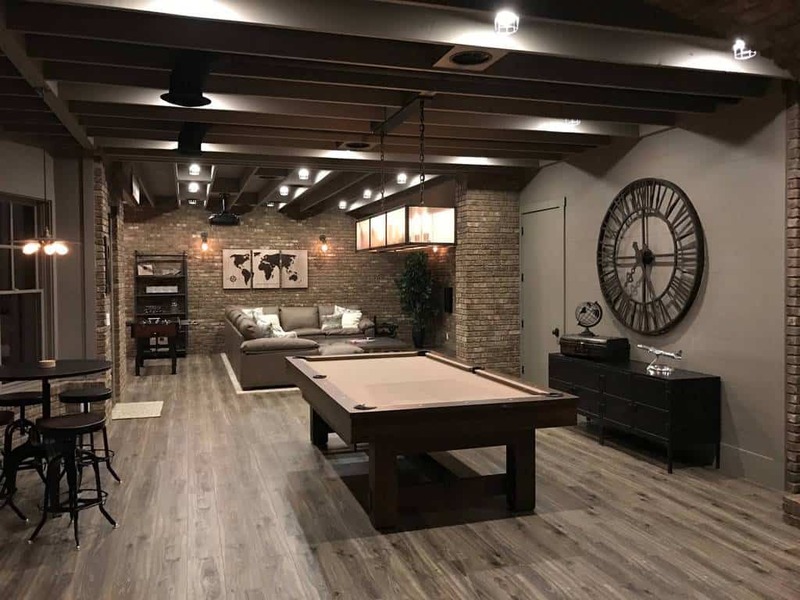 The brick finishes create a visual divide between the seating area and the billiard table. Sensual grey paint matches the velvety fabric of the sectional sofa. Flames on the fireplace add to the allure. 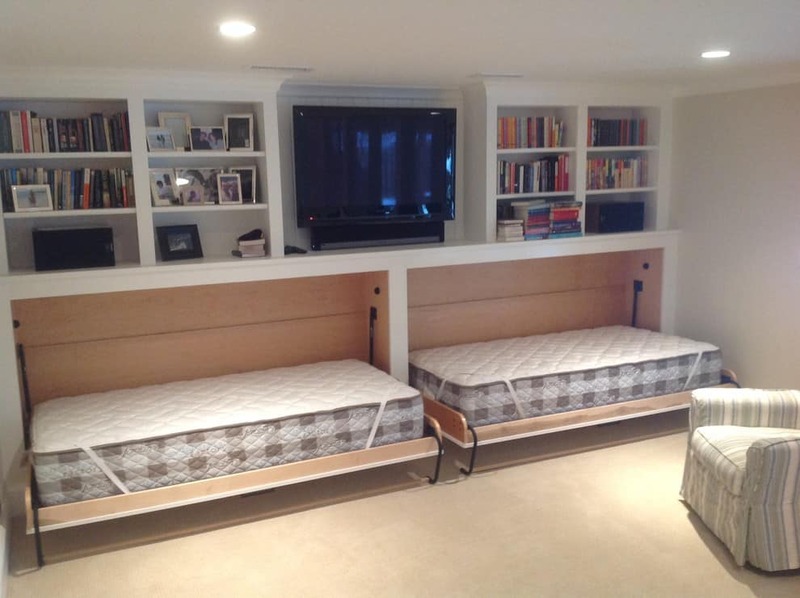 A set of Murphy beds opens up and adds a cushioned flexibility to the function of this media center. 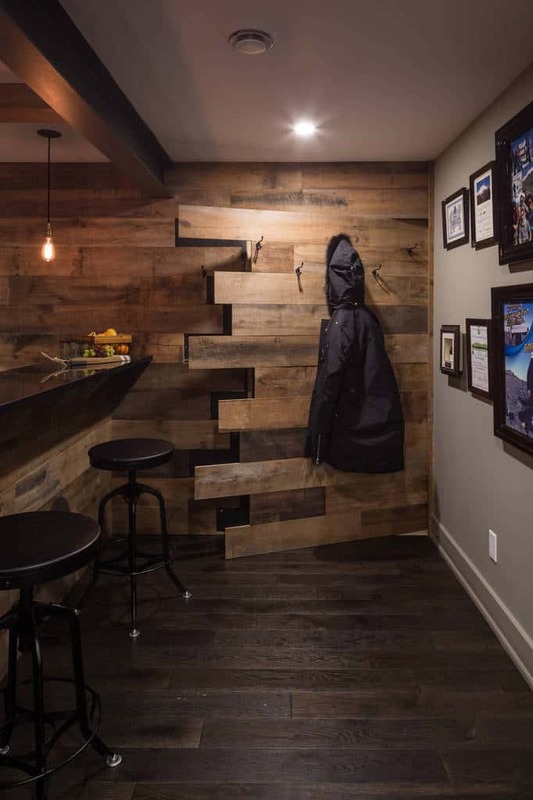 Well-appointed wood finishes add a hint of rustic appeal to this contemporary interior. The grey walls and carpet flooring serves as a backdrop for an understated modern vibe. 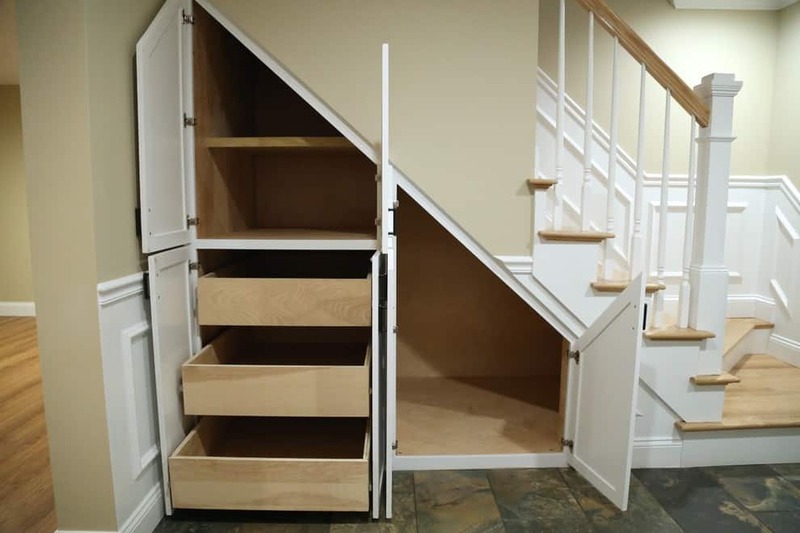 The space-saving storage under the staircase will make all the clutter gone in a minute with an aid of sliding drawers and spacious cabinets. 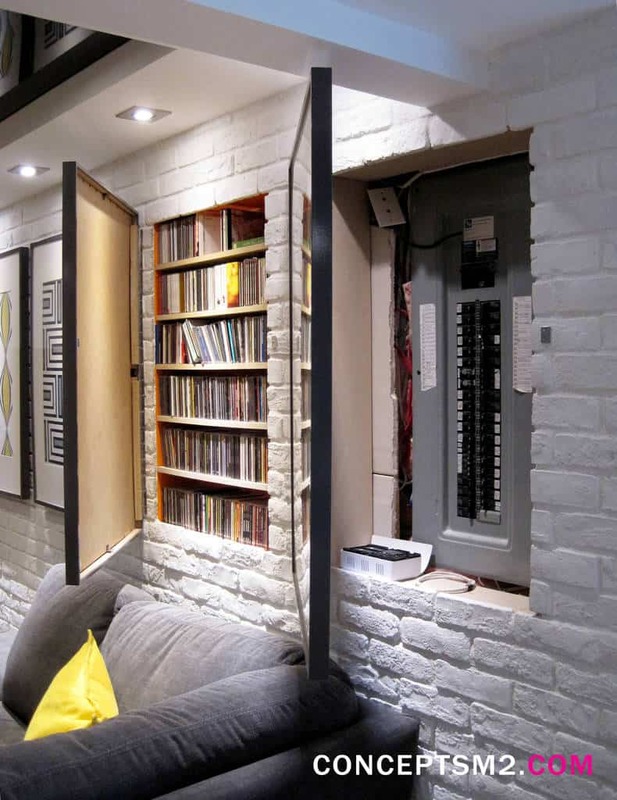 Create a hidden passage to a storage room by masking a door to look like built-in bookshelves. This is perfect for dead spot areas like the side of the stairs. 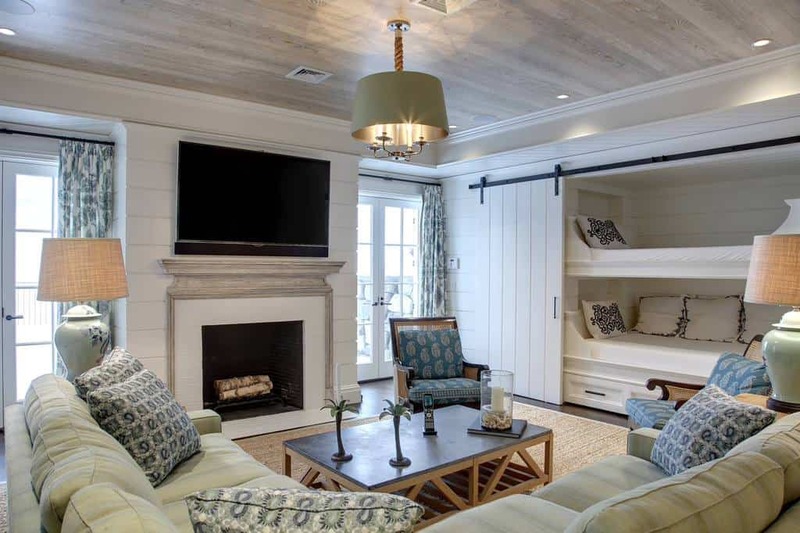 Utilize a mirror or an artwork in a swinging frame to hide unsightly electrical panel or embarrassing guilty pleasures as seen here. A kitchenette with wooden cabinetry is accentuated with a grey armchair and round green ottoman. White paneled wall exudes a feeling of purity and cleanliness. 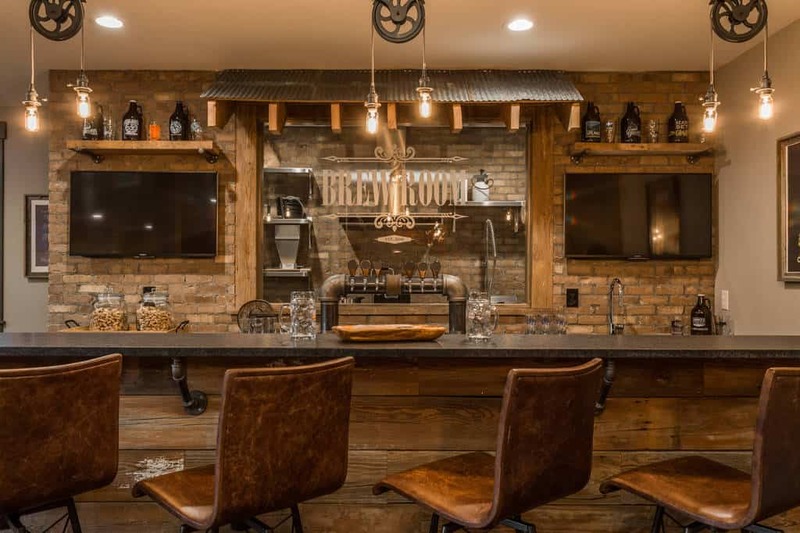 Terra-cotta stone texture decorates the back wall of the kitchenette which paves the way for the use of the wood facade of the bar. Filament-type lighting provides an energizing glow and completes the industrial appeal. Brownstone finish in the back wall brings the outdoors inside this trendy apartment. The glass sliding door provides privacy for the both rooms. 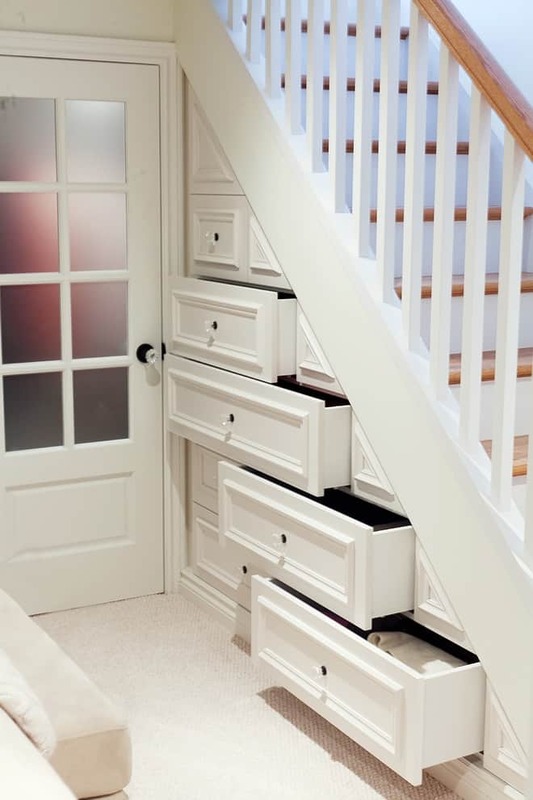 Drawers fitted under the staircase serves as additional storage. Painted in crisp white color, it provides functional aesthetic to the inhabitants. 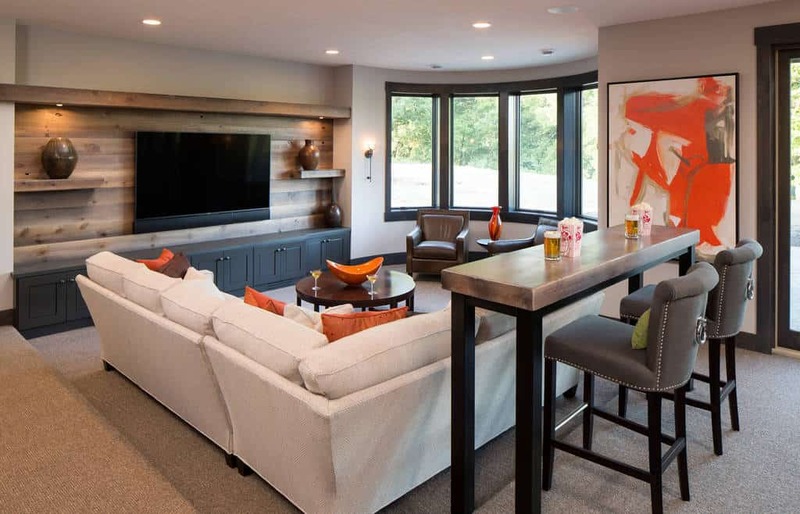 A glass bay window allows light to pass through and create a cozy ambiance to the seating area with orange accents fitted with a white sectional sofa, tall table, and barstools facing a flat-screen TV. The pale blue wall accent of the dining area lift up the room’s ambiance of a well-lighted interior. 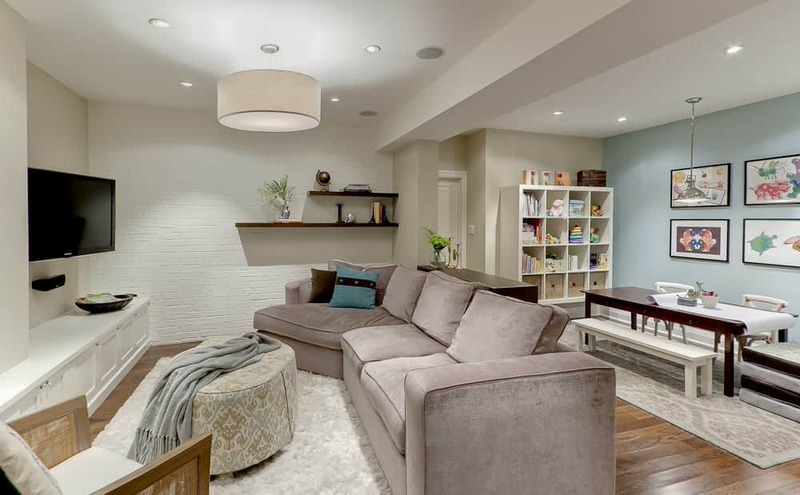 Painted brick walls and round ottoman elevates the feminine appeal. The bricks on the wall interplay a contrast of texture with the rest of the white paneled walls and appoints the beige sectional sofa and luggage coffee table as a functional accent.